What's better than wrapping up the year with a finish? My Memories of Provence BOM is done and I couldn't be happier, happy that it's done and happy with how it looks. It finished at 84" x 101"
The pattern is Memories of Provence by Monique Dillard for Open Gate Quilts. It has approximately 1,312 pieces. 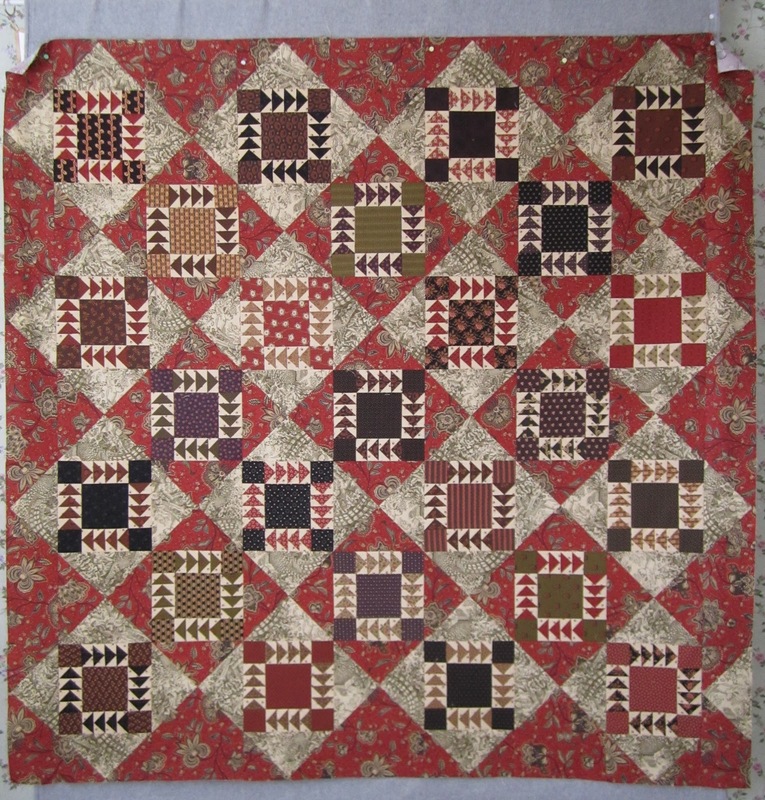 If you like the looks of this quilt and think you would like to make something similar, Monqiue at Open Gate Quilts is introducing her free BOM tomorrow. 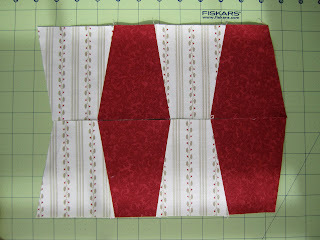 Stop back by, I plan to sew along and have pieced my first two blocks. 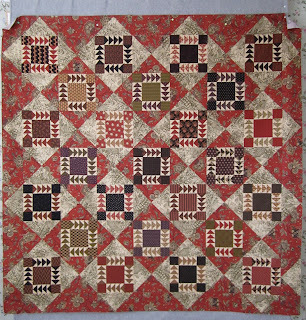 I'm going with something totally different than this quilt and something totally different for me, but so far so good. This will be my last BOM rehab for Sinta's sew along, I don't have any other BOMs to work on! 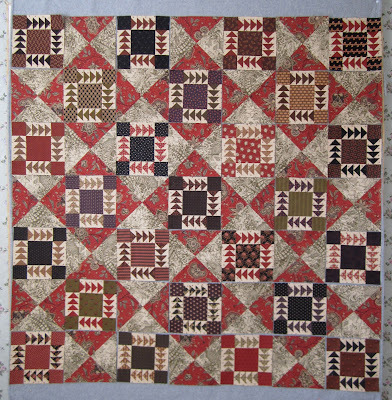 But if it weren't for Sinta's sew along I know I would not have finished this quilt this year. Thank You Sinta!! So I was looking at all the finished ornament blocks on my design wall and I just couldn't shake the feeling that something was missing. It took awhile for me to figure out what, then it hit me, the ornaments were levitating not hanging! After decorating 3 Christmas trees this season, I have a lot of experience with hanging ornaments. So I decided to make my ornaments hang by adding a little gray "ribbon" to the top of each ornament block. The strip of gray fabric is 3/4" which finished at 1/4". 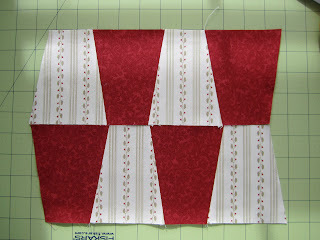 And just a reminder, my blocks are 6 inches, not 9 inches like the blocks in Camille's Vintage Holiday pattern, which is the pattern I'm using for my project. 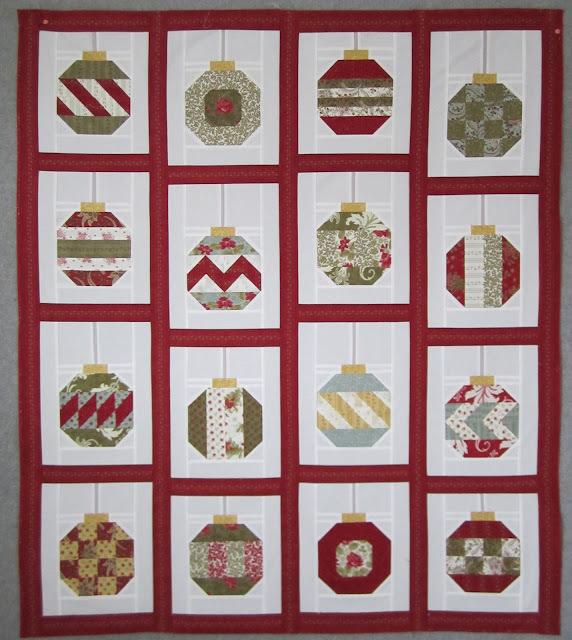 Then I got to thinking some more, how I didn't want all the ornaments hanging exactly the same, so I added 3 different lengths of "ribbon" to the blocks and came up with this. Then I added my sashing and ended up with this. It doesn't show up in this picture, but the sashing fabric has the prettiest little green leaf design. Right now this project is around 44" x 51", I plan to add an outer border, but not yet. If I added a border to this project it would be done and go on my Lifetime Quilt list as number 99. But I want Memories of Provence to be Lifetime Quilt Number 99. And if I added the border after I got MoP finished this would be Lifetime Quilt Number 100, and this is NOT Lifetime Quilt Number 100, so it looks like I'll start the year with a UFO after all. I know a lot of you are so relieved to hear that! We had the nicest Christmas at our house, my daughter was able to make it home for a few days and we enjoyed every minute of our time together. I hope Christmas was just as merry at your house. Do you work with jellyrolls very often? I use one every now and then and I like them. You get a long strip of fabric that is 2 1/2 inches wide for every fabric in a family of fabric. I'm amazed by what I can make with those strips. I usually complain a little when I work with jellyrolls, how do I account for those little clipped points on each side and those clipped edges usually produce fuzz that floats around my sewing table. I'm not complaining about those clipped edges anymore, this is what a jellyroll use to look like, when they were cut with a straight edge. 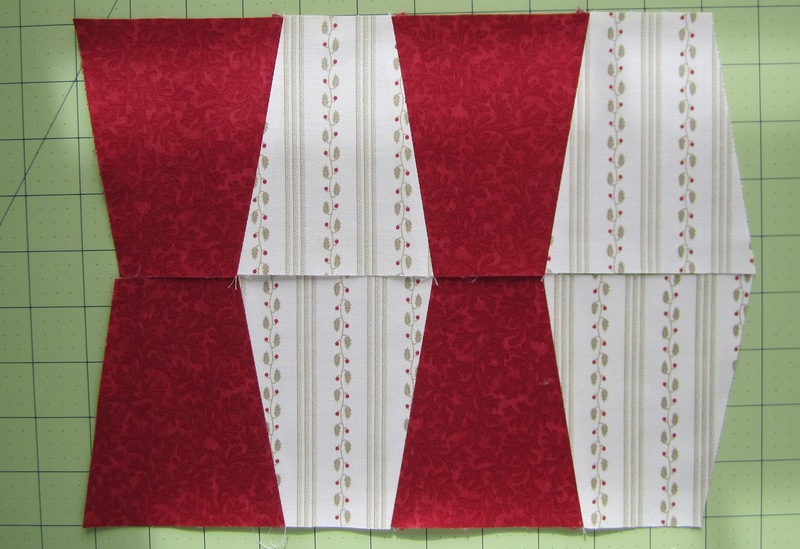 This is a jellyroll of Roman Holiday by 3 Sisters for Moda, I'm not sure when that family of fabric was released, but I think it was at least 5 years ago. By the looks of this roll you would think I've been carrying it around in my purse for 5 years, but it has just been molting in a bin in my sewing room closet. I figured I better use this roll for a quilt before it was just a useless ball of thread. And this is what I'm going to make with that fabric. 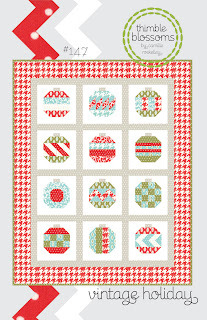 Vintage Holiday by Camille Rosekelly for thimble blossoms. 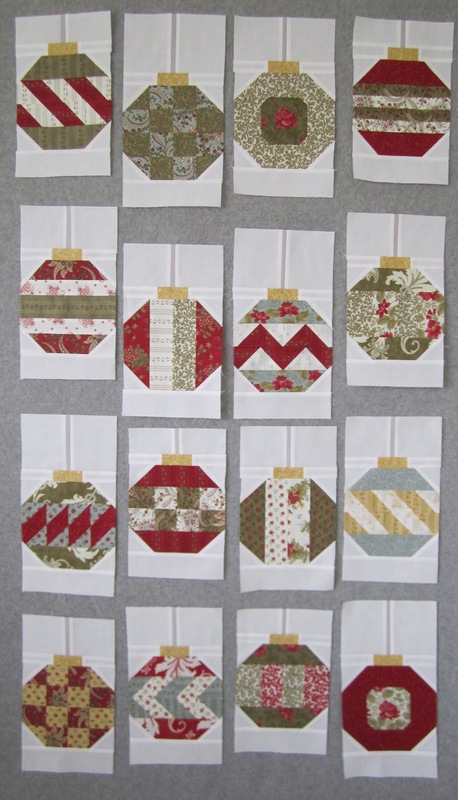 I've seen these adorable ornament blocks pop up all over blogland and thought I would join in the fun. That Roman Holiday jellyroll is the only holiday fabric have in my stash, that sure cut down on the fabric drama for this project. 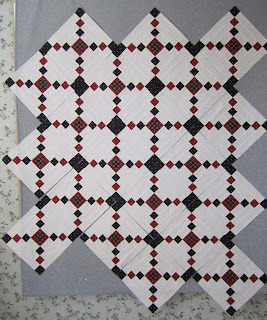 I think the blocks in the pattern finish at 9 inches, I'm shrinking mine down to 6 inches. 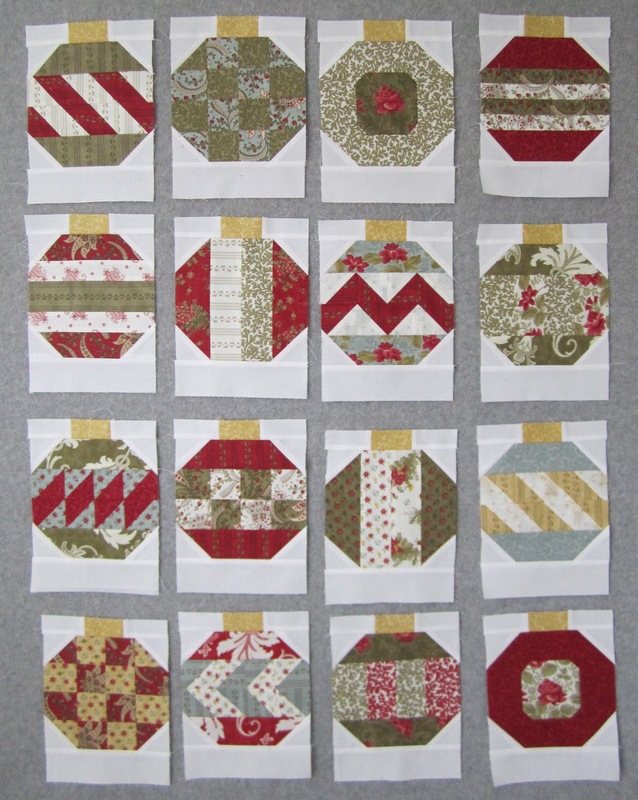 The blocks are easy and they go fast, the perfect little project to squeeze in between all the holiday hoopla. I just love working on a holiday project during the holidays. It took me no time at all to make the flying geese for that border and finish up this quilt. 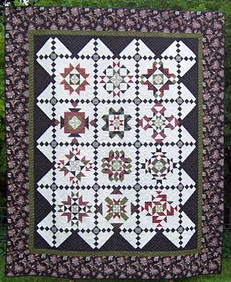 The pattern is Wild Air by Miss Rosie's Quilt Co. 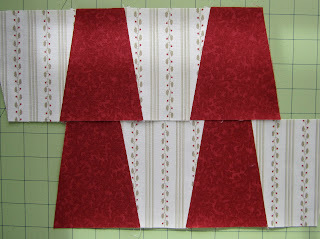 I did make one small change to the pattern, I used the same fabric for the center and corner squares in the pieced blocks, the pattern has two fabrics for the squares, one for the corners and one for the centers. You know how I'm always trying to match everything up, I decided it would be easier to match two fabrics, one for the geese and one for the squares, instead of three fabrics, one for the corners, one for the center and one for the geese. Now that's it's done I'm thinking maybe I would have liked having those corners a different fabric. This is Lifetime Quilt Number 98. It finished at 76" x 76". It has approximately 2,261 pieces. 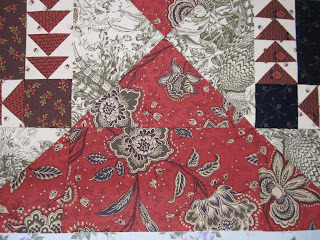 The red floral print fabric is Annandale by Jo Morton for Andover Fabrics. The majority of the remaining fabric is also Jo Morton fabric. If the geese in this pattern are stopping you from making it, you need to think up a better reason, this quilt goes together in no time, and those geese, if you use the Fit to be Geese ruler, are fun, easy and go quickly. I'm so glad I dug this project out of its project box and finished it up, if I'm able to get all the blocks together for Memories of Provence here in the next couple weeks I'll be able to start 2013 with no UFOs! Imagine that! Now that Wild Air is finished maybe I can focus on finishing up the items on my Christmas To Do List. The decorating is done, done as in I quit, let the wrapping begin. My Wild Air blocks went together in no time. The inner border came together quite easily too, or so I thought, until I looked at this picture!!!!! Bottom right, see it, I've got one block sewn on backwards! UGH!! Haste makes waste, there's a reason these old sayings are around, mainly because they're right! Oh well, it could be worse, I could have noticed once it was back from the quilter! Although I'm sure one of you would have caught the error too, you're good about that. I'm not sure this large floral print was a good choice for the focus fabric. I tried to match up that border as best I could with the blocks, but it doesn't look as good as I would like. 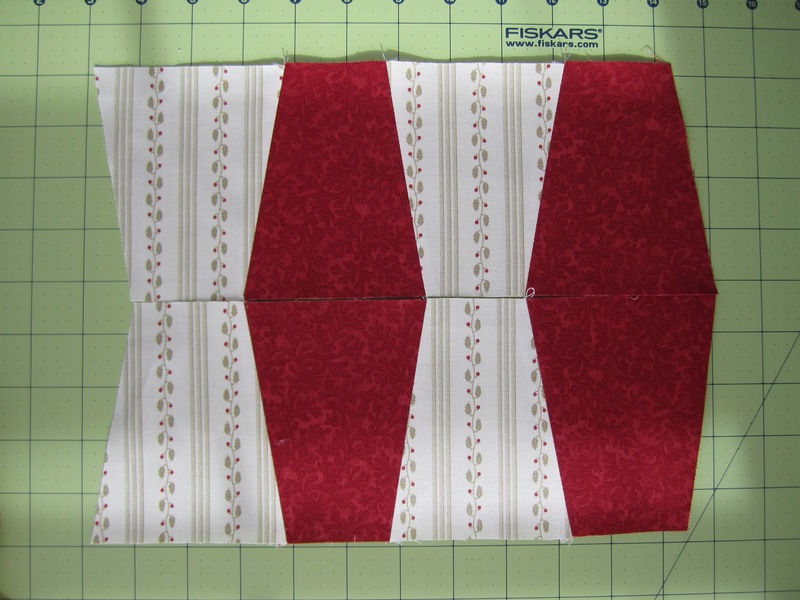 The quilt on the pattern cover used a smaller print fabric, I now see how that would probably blend better. I'm hoping once it's all done and quilted the piecing won't be so obvious. Now it's on to the 23 bazillion geese for the border. If they didn't look so cute on the pattern cover, and if I didn't have my Fit to be Geese rulers, I would be tempted to call it quits right now. But I enjoy making geese and look forward to sneaking in a few while I juggle everything else that needs to be done. I'm still decorating and shopping, I sure hope I'm not the last person doing so. I'm still decorating the house for Christmas, I'm starting to think "quit" may happen before "done". One aspect of my decorating that is done, all my holiday quilts are out. This is the third year I've hung my Christmas Tree quilt, Lifetime Quilt Number 53, "O Christmas Tree" in the living room. In an earlier post I mentioned no one used our guest room, well someone's decided he likes that quilt and has been napping in the guest room most afternoons. This is Countdown to Christmas, Lifetime Quilt Number 78. There are only 3 quilts in the sunroom right now, Olde World Stars, LQ#67, is on the love seat on the left and Fathers Fancy, LQ# 20, is on the couch on the right. 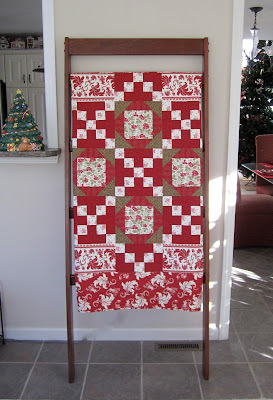 Neither quilt is technically a Christmas quilt, they aren't made from Christmas fabric, but I think they look festive. 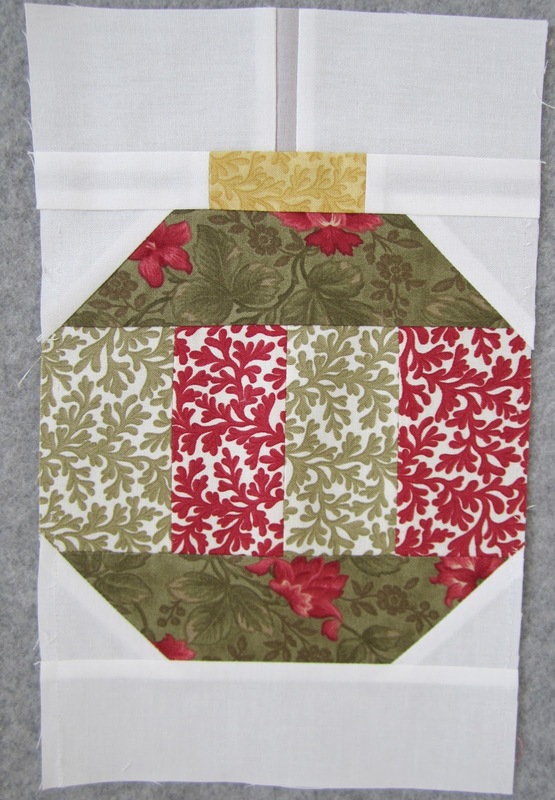 Instead of the usual 4 quilts on my quilt ladder I'm going with just one for the holidays. Red, White and Wonderful is LQ#64. And finally, Toulouse, LQ# 54, is on my bed. In the past I put a Thimbleberries row quilt on my bed, Hometown Christmas, LG# 13. But I just wasn't in the mood for the dark colors of that quilt this year. I'm really enjoying Toulouse. So I don't have as many quilts out as usual, but I'm loving the few that are out. My Christmas decorating has been put on hold while we work on some home improvements. This has given me some sewing time. All my Wild Air blocks are pieced. Having everything cut out and ready to go really helped speed things along. All the fabric is by Jo Morton, mainly from the Annadale family, except for the green toile background fabric. The home improvements are done for now and I finally got started on my Christmas decorating. I have no excuse for being so far behind on my shopping, but it is what it is! Not to freak you out or anything, but Christmas is TWO WEEKS from TODAY! 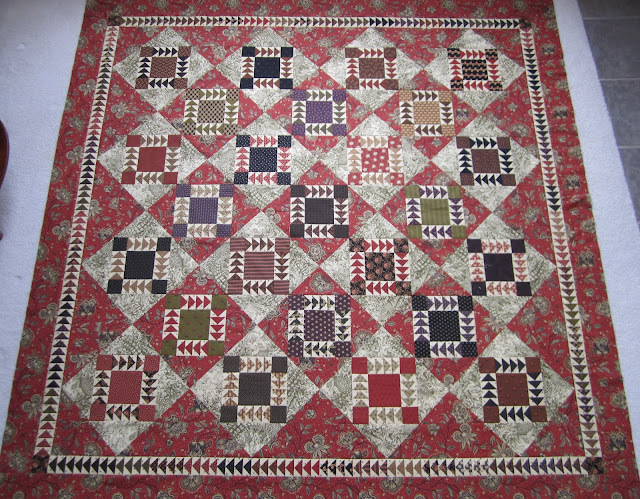 I sure enjoyed reading what everyone was wishing and hoping for for Christmas, we are an easy group to buy for; give us some time with family and something quilt related and we're happy. Here are the winners of "The Crumbler", I'm thrilled you love the name too. jmniffer who is asking for "The Crumbler (better take that off the list!) EQ7 software, and fabric. Teri at Patchwork Playground who is asking for some quilting books. Thanks to all for leaving comments and participating in my give-away. I finished up my Memories of Provence setting blocks in November and almost forgot to blog about it! They would make a very pretty quilt all on their own. But will look so much prettier when added to my focus blocks. Here's a reminder of what the finished quilt will look like, well mostly look like. I have made a few little changes. Almost every time I blog about Memories of Provence someone wants to know where I got my BOM and can they get the pattern. 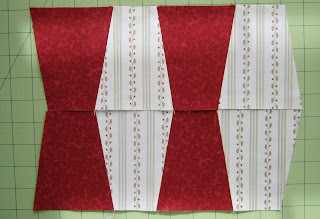 I've got some great news, starting in January Monique Dillard, who designed the Memories of Provence pattern and fabric, is going to be offering a free block of the month on her blog, Open Gate Quilts. And here is the pattern. If you like Memories of Provence you'll also like this quilt. I think it has the same look and feel as MoP. 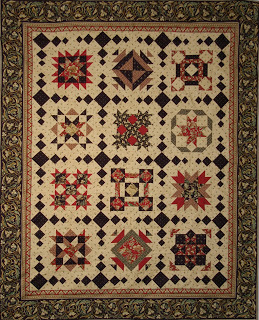 There are a couple of choices on the size and Monique will be offering some kits to make the quilt pictured using her latest line of fabric, Royal Gardens. For more details read Monique's blog here. 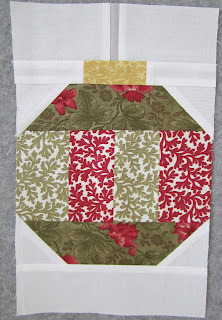 I plan to sew along, I hope you can squeeze this into your 2013 quilting schedule too! Check it out and join in the fun! Remember this project, Wild Air by Miss Rosie's Quilt Co? I didn't finish my Wild Air in class, (does anyone ever finish their project in class???) and in June, 2011 blogged about my fabric drama and how I was going to save this project for the fall. (click here for that post, or not, you may have enough of me and my fabric drama) Well at the time I thought I was talking about the fall of 2011, and here it is, the tail end of fall 2012, but I'm going to finish this quilt, before the first day of winter, December 21, this year! And I think it's going to be easy, even though this is a busy time of year. This is my only UFO, I usually start a quilt and finish it during one space of time, or, I start it, hate it, and move on, never thinking about it again. But I sure am appreciating the benefits of having UFOs with this project. Here's my project box, it's like a little quilt gift. I've already gone through the fabric drama phase of fabric selection plus everything is cut out! 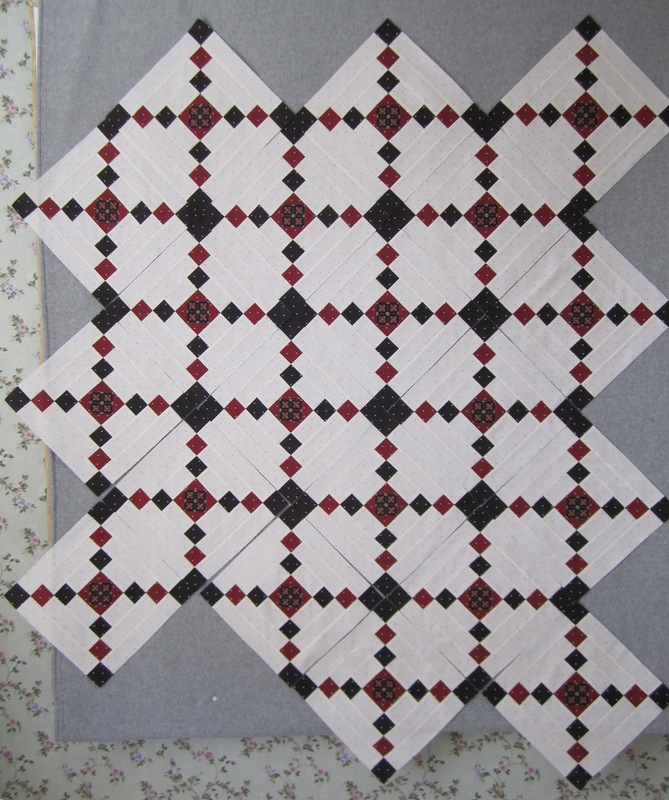 And I even have some blocks made, this quilt practically made itself while it was sitting in that project box. 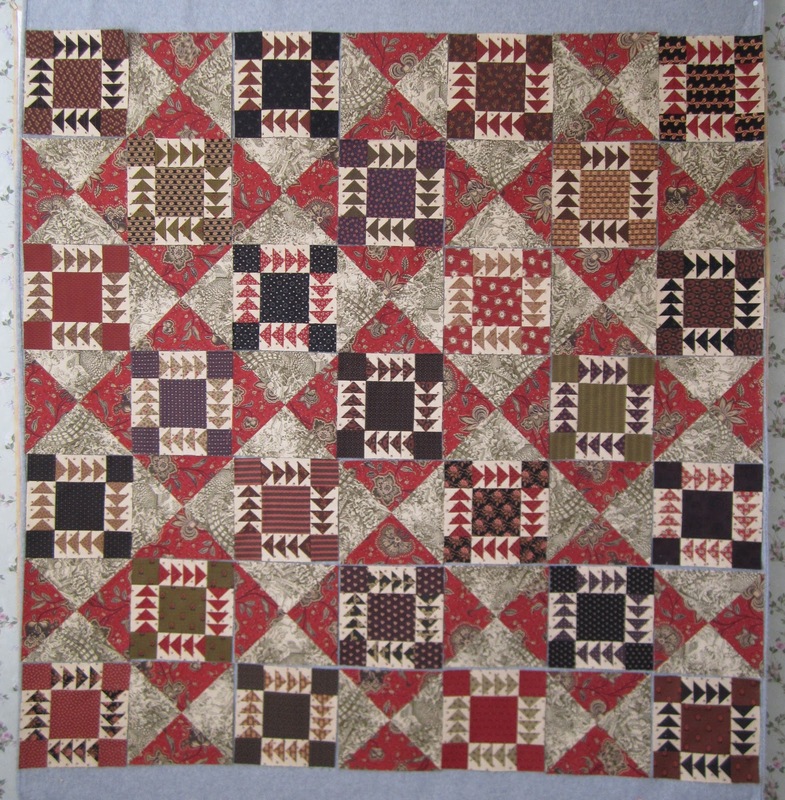 I looked on-line to see if anyone else had made a Wild Air but didn't find a single finish in blogland, which surprises me, I love the look of this quilt. I wonder if all those geese scared quilters away. I'm looking forward to making those geese using my Fit to be Geese ruler, plus that method of geese production makes geese in groups of 4, perfect for this project. Maybe you have a Wild Air UFO too, want to join me for a great finish to 2012? Another reason I'm wanting to finish this quilt, it will be Lifetime Quilt #98, making my Memories of Provence BOM #99, and a clean slate for starting #100!